G. W. Cool House | Historic Jacksonville, Inc. The small 1858 “saltbox” style home at the corner of California and North 6th street in Jacksonville is historically known as the G.W. Cool House after the individual who constructed it. Cool had received his Doctor of Dental Surgery degree from the Baltimore College of Dentistry. He came to the West Coast in 1850, practicing first in British Columbia and then in Washington before settling in Oregon. The house was both residence and dental office. However, his practice appears to have been lackluster since a mechanic’s lien for construction costs was attached against the property. 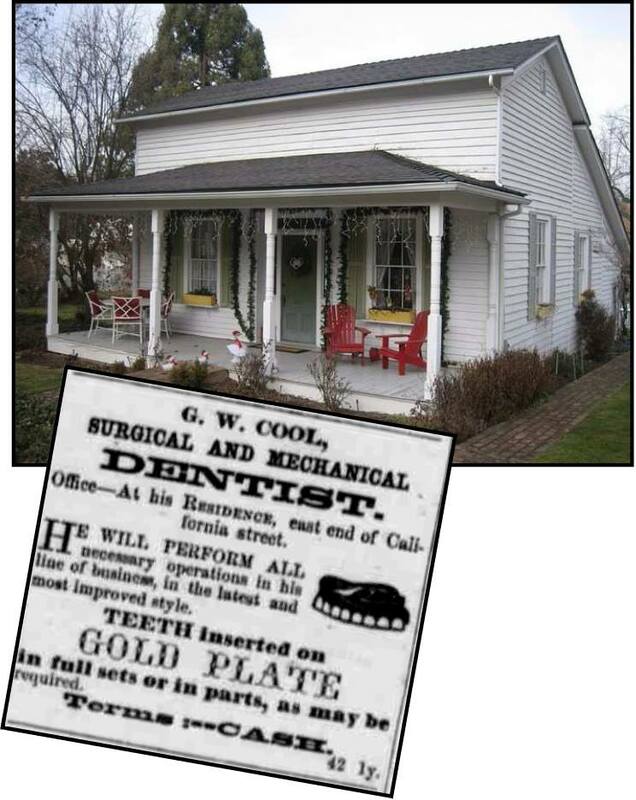 By 1861 Cool had moved on to San Francisco where he did experience success and was one of the first members of the California State Dental Association.